My wife and I moved up to Bothell, WA from the SF Bay Area in June 2006 after living in California my whole life. We're loving it up here. I'm a "Sr. UI Engineer" (aka Sr. Web Developer) and I telecommute full time. I'm 32 and drive a 350Z. I got into digital photography in 2001, got a Canon G3, upgraded to a 350D in 2005, 40D in 2007 and now a 5D Mark II in 2009. I've been bit by both the lens bug and the Strobist bug. Various backpacks, small camera bags, duffels, etc. 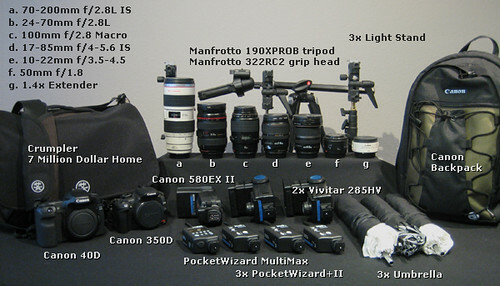 Filters, WhiBal, lens hoods, wireless remote, light stands, umbrellas and other accessories. Adam Lyon doesn't have any testimonials yet.